Apple Card offers a new form of Mastercard credit card to users, and it's partnered with Goldman Sachs to bring out a new suite of functionality. It can do things other credit cards can't do. You can sign up on your iPhone, and within minutes start using it right away - anywhere worldwide. It'll be available across your devices, and will be found in your Wallet App, with clear spending tracking - with store names clearly listed - and details on when your next payment is due and how much you've spent this month. You can also message Apple to update your Apple Card details. There are no late, annual, international or over-balance fees and Apple says it's committed to giving you a low interest rate with Card. Here's the thing: the Apple Card will come with no fees. No international fees, late fees or even a higher rate of interest if you miss a payment - you can choose to make payments more regularly, or to change your schedule if you so wish. However, there was no mention of a typical APR here, so while it's rather easy to sign up, we're not sure how competitive it'll be 'in the wild'. Apple is all about shaking up this market though, and offering a truly attractive card could be an instant revenue stream for the brand. Apple Card also offers rewards, with Daily Cash giving you 2% cashback every time you spend, and it's paid every day. If you use your Apple Card to pay for a product direct from Apple, you'll get 3% cashback. Every purchase is verified with either Touch or Face ID, and all details of the card are stored on a secure area of your iPhone. Apple also can't see what you've spent your money on, with all processing taking place on your device and not on Apple's servers. Apple also promises not to sell your information to third parties. Apple Card is widely accepted around the world, but not everywhere accepts it, and for places which don't Apple will also offer you a physical card. It's made of titanium, and has Apple's logo and your name laser etched on it. There's no card number, CVV or signature on the card, which Apple says makes it more secure. If you need that information, you'll find it in the Wallet app. Apple Card will arrive in the Wallet app in the US "this summer" (likely sometime between June and August), with no word on when the service may roll out to other countries. 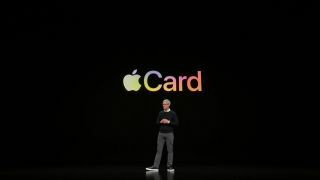 We spent hours typing away at everything that happened during the Apple event tonight - so here's the inside scoop on what happened when the Apple Card was unveiled on stage. 10.36 - What about if you're somewhere that there isn't an Apple Pay vendor? Well, let's watch a video to find out. Apple has made an actual bank card, apparently. It's made of titanium and has your name laser etched onto it. With no card number, signature or anything on it - so how can it be used if you want to sign? You only get 1% Daily Cash with this card though. Apple Card will be coming to the Wallet app 'this summer' for the US. 10.34 - It'll be powered by Mastercard, so you'll be able to use it world over. Now we're talking about privacy - so each purchase is authenticated by Face ID or Touch ID, and every purchase needs a random ID so your credit card number can't be used without your say-so. Bailey is making a big deal about the data never being sold to third parties - that privacy message is strong here. 10.32 - You can make more frequent payments if you fancy it, to help people take better control of your money. Actually, this will help: no fees at all with this card. No late fees, international fees... any fees at all. The interest rate won't change even if you're late, so no penalty interest charges. Apple needed a bank to help with this: Goldman Sachs, as it's a new player in the consumer space. Isn't Apple Bank going to be a bit of a clash here? 10.30 - Apple's Daily Cash comes in every day - it just depends on which merchants are using it. Wait, it's 2% of Daily Cash on everything you spend. That's pretty good. 10.29 - Now we're talking about Apple Card rewards too - you get cashback every day with Apple Card - it's called Daily Cash. 10.28 - Apple is now saying that it's trying to make things better, to improve financial info. Using Apple maps, random retailers and addresses will be translated in the app. That's pretty helpful. Like so many online cards, you can collate your spending by category and show you how your spending is trending week by week, or month by month. 10.27 - You get the Card on your phone in minutes when you apply - is that definitely a good thing? The Card lives in the wallet and shows you how much you've spent and how much you need to pay back. You can also message the Apple Card team through messages and they'll offer help where possible. 10.25 - 'Today is introducing a brand new service - and we call it Apple Card'. Jennifer Bailey, VP of Apple Pay, is coming on to explain that. 'We've rethought the credit card'. Here we go.